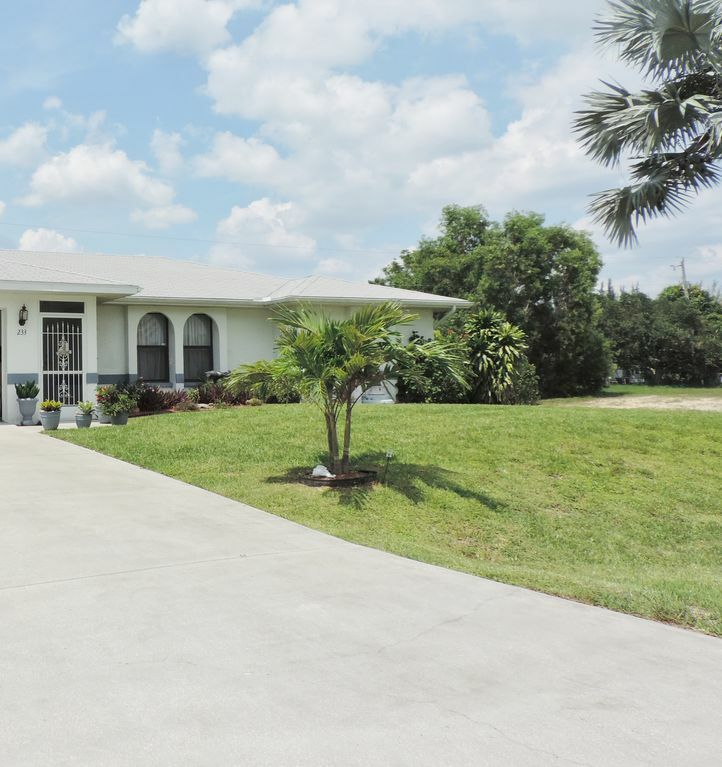 This fully-stocked comfortable 3-bedroom, 2-full bath vacation home is located in desirable SW Cape Coral. With two sitting areas and the enclosed pool area, there is room for entertaining, swimming, sunning, and dining out. Enjoy comfortable, vacation living at this pool home. This home features a great room with raised ceilings and pocket sliding glass doors, which open onto a lanai and pool. The large Master bedroom suite also opens to the pool area, and has a cozy pillow-topped king-size bed. The lanai as just been rescreened and the pool resurfaced. There is a new central a/c and heat. All rooms, as well as the lanai, have ceiling fans. All ceiling fans have been upgraded except for the living room and back bedroom. Backyard is fenced with a doggie door which leads from the lanai to the backyard. Bamboo flooring in all three bedrooms with newer tile floor in the remodeled kitchen.The rest of the house has newer carpeting. Yard has recent updated landscaping. This vacation home sleeps 6 persons comfortably; there is no need to bring anything! Due to the use of extra water and electricity for more than 4 people, there will be a fee of $25 per person per night for any amount over. You’ll find everything you need already there, from the bed linens to the cookware, a grill, and even beach chairs; just grab favorite groceries from a number of grocery stores just minutes away and relax in peace. The house is not one of the newer ones. It is over 20 yrs. old so please don't expect a newer bright and shiny house. This is a comfortable lived-in home. There are newer bamboo floors in the three bedrooms with a renovated kitchen and the master bedroom and and 2nd bath. A 32' flat screen TV in the great room. The heated pool has been resurfaced. Pool is heated via propane, which the renter is responsible for. The heater will not work because there is no propane in the tank. It must be ordered and paid for by the renter. This vacation home is only minutes from outlet malls, fishing, beaches, golf courses and beautiful nature preserves. Also this home is a short drive away from the Spring Training homes of both the Boston Red Sox and the Minnesota Twins. Also close by are the Edison/Ford homes. If relaxation is what you seek drift away in your own private pool and enclosed lanai. This house is perfect for the family getaway or the newlyweds! Quiet neighborhood, yet conveniently located to the beach and many shops; or even a day trip to Miami! Oh and the back yard is completely fenced in so bring Fido along and truly make it a family vacation! There is a rental contract to be signed. Payment must be received 2 weeks prior to rental date. There is a refundable deposit of $350.00. Policy may change depending on reason for a cancellation. Cancellation Policy: If cancellation is due to illness or some unforeseen emergency, refund will be given. Rules: Rates are subject to change without notice. No smoking. Propane tank for grill to be refilled by renter. During the winter season, we now have to request the renter pay for the propane to heat the pool as we found people have been heating the pool to high temperatures and leaving the heater to run constantly. To curtail this we've had to change our pool heating policy. We apologize that a few renters have caused this change and hope you understand our situation. Off season due to air conditioning usage, a fee of $50/wk. will be charged. Cable TV and internet use included as well as a land line phone. There is a contract to be signed prior to rental. A fee of $180 will be collected for cleaning fees. My husband and I live in NH. We bought this as a second home after we sold another home in Maine. We enjoy the quiet life but love to travel. We have two sons, two daughter-in-laws, a granddaughter and 3 grandsons. I love to antique and go to auctions which I do both in NH and FL. We have both retired so will be enjoying the home from Jan through mid-April away from the winter weather of the north. We choose to buy in Cape Coral after visiting the area for several years. The first few we stayed in Ft. Myers and then rented homes in Cape Coral. We have been all over Florida - east and west coast and inbetween. We decided we liked the west coast best and the Cape Coral area, so we purchased our future retirement home after viewing several other homes. The enclosed pool and lanai, the fenced in yard was another reason. The home is in a quiet neighborhood. It is a corner lot which gives us a little more space than the rest. You have the benefit of using the pool and having privacy or you can venture to Cape Coral beach 15 mins away. If you'd rather have a larger beach, Ft. Myers beach and Sanibel and Captiva are within a half hour's drive. There is all kinds of shopping nearby with a Publix super market and Target within walking distance. The home is a 3-hr. drive from either Disney or Miami and 2 hr. drive to Tampa. We love going to Shark Valley in the Everglades which is about 2 hrs. Also, we love to hit the FleaMasters Fleamarket on the weekends. You can find just about anything there from vegetables to paintings. toilet, combination tub/shower, Shared with 2 bedrooms; is also the pool bath -new vanity. Both baths have a tub with a shower in it. Both use shower curtains. Second bath does have a linen closet and beach towels. Baths have color coordinated towels. Linens are kept in the bedrooms according to the bed sizes. Please put back in correct bedroom after cleaning. Also replace any that may be damaged during your stay. Double car driveway will fit at least 4 vehicles. Each bath has its own towels. Second bath contains beach towels. Water and ice dispenser on the door. All perishable foods must be removed upon departure. Electric with ceramic cooking top. Ceramic cleaner and pad are kept under the sink. Electric with double rack and a drawer underneath. New 12 cup coffeemaker. Usually has filters available. Spices and some items that are non-perishable are left. Galley with cabinets and a small pantry closet which has been newly renovated with new cabinets, counter tops and tile floor. Has a maple table with leaf and 6 matching chairs with hutch. New 32' flatscreen TV in great room with satellite tv on all TV's. Master bedroom has 27' TV (not flatscreen) and second bedroom has a 21' TV. DirecTV with basic channels and a few movie channels. Assortment of books in entertainment center. A few toys are kept in the garage. A few DVD's available for viewing. Fenced in backyard for children or animals. At the high school which is within walking distance. Pool has just been resurfaced. It can be heated if you'd like. Renter pays and orders propane to heat pool. Not included in rent. close to all amenities, shopping, dining, beaches, Red Sox & Twins spring training, etc. We are a family of 5 with 3 kids. Barbara's home was extremely comfortable and is exactly as pictured in the photos. When we arrived there was a platter of cookies (which were delicious and instructions for us) and the house was decorated for Christmas. Barbara was very responsive to all of our communications both before, during and after our stay. We enjoyed the split floor plan with the kids bedrooms and bathroom on one side of the house and the master on the other. The house is not fancy and there was carpet in some of the rooms, but it was clean and had everything we needed. (Including an updated kitchen and spacious Master Bathroom). Plenty of linens, towels, beach gear, washer/dryer, etc. We also brought our dog with us and he really enjoyed the fenced in backyard and doggy door. The kids used the TV in the den and there was no TV in the living room (so aside from the TV in one of the guest rooms) there was only one very small TV in the master bedroom left for the adults to use. This is not really a major negative for us since we were enjoying the outside most of the time, but just for your information if you are use to large TV's. The one thing that was disappointing was the temperature of the pool. 71 degrees may be brisk for some adults but it was too cold for our kids. We did discuss this before hand with Barbara and she was upfront about it being extra to heat the pool and so we paid for the propane as agreed. Unfortunately, we did not realize how quickly the propane gets used up, since we don't have experience with this. In an attempt to heat up the pool for the kids, all of the propane was used before they could actually swim in the pool. That being said the pool was pretty and very clean. It was a little disappointing that we didn't get to enjoy it, but we went to the beaches instead. This would not stop us from staying here again. The house was in a safe location and was conveniently near Publix and Target. We were able to enjoy Cape Coral, Fort Meyers Beach and Sanibel from this location by car. It truly felt like our home away from home, which I think is the real purpose of the HomeAway service. Thank you Barbara for making our vacation time a wonderful experience. Thank you for your kind review. I am sorry you didn't get to use the pool. We never heat it when we stay at the house so had no idea about how fast the propane goes. Others who heated the pool never mentioned it. I am glad you shared so I can convey to future renters. I certainly understand about the TV in the master bedroom. I am looking to upgrade to a larger TV. I am happy to hear your dog enjoyed the fenced in backyard. Ours does, too. I appreciate your review and hope to share the house with you and your family again in the future. I stayed at this house for over 3 months while my house was being worked on. I never felt any stress about staying at someone else's house. It always felt like home. It isn't fancy, but it is comfortable. Much more important. Thank you so much for your wonderful review on our home. We enjoyed having you and your fur babies. So happy to hear you felt like home. That is what we strive for. We wish you much happiness in your home once you can return. It is great when we can host such caring and thoughtful people as yourself. Thank you for taking such terrific care of our home. Thank you Barbara for sharing your home with us (and our dog). The property was very comfortable and relaxing, we were very well pleased with all that you had to offer. It was so nice to be able to swim in our own pool. Even the pool cleaning people where very nice & courteous (please be sure to let them know). Barbara you where awesome to work with. You answered any questions we had in a very timely manner. Cape Coral has so many amenities to offer in shopping, entertainment, etc... This was our first time using VRBO and we couldn't have picked a much nicer place to stay. We will consider your home for any future Florida trips. Thank you once again. Thank you, Lori, for your kind words. I try very hard to address any issues in a timely manner. We welcome wonderful renters such as yourselves and their pets. Thank you also for the kind words for our pool care people. We have used their services for many years and have recommended them to friends in Cape Coral who are also happy with them. I will pass your words on to them. Thank you for leaving the house so clean as reported by our cleaning service. It is really appreciated. We love Cape Coral and are very happy we bought there. We certainly hope you will keep us in mind for any future visits to Cape Coral; we would be more than happy to welcome you (and your dog) back. Our family moved to Cape Coral and found this home to rent until we found a home to buy. We loved the fenced yard with dog door & pool was larger than most! Loved sitting on lanai watching and listening to the storms roll in. Neighbors are friendly, good safe neighborhood to walk in. Close to Veterans, Publix, loses, & Target are within a mile! Landlord was very responsive when the fridge was struck by lightening / in getting a new one delivered. We'd recommend to anyone! It is always a pleasure to have responsible tenants. Thank you for taking such good care of our home. This home has everything we are looking for. We just wanted to thanks you and tell you how much we enjoyed your home and we hope to book again on our next trip to Florida. Your home has everything!! Great pool, the grill, great kitchen, lots of room so we were not on top of each other, we loved it!! The home is located close to everything! Yes the home is not brand new, but very clean and well maintained. We will recommend the property to friends, and we will book this property again! Beautiful vacation home. Very spacious and extremely clean. The pool is great! Very refreshing and private. Located in a nice quiet neighborhood, but only a short drive to the beach. The house is supplied with just about everything you will need. I would definitely recommend this property to anyone looking. Shelling, snorkeling, diving and some other activities are available in surrounding areas such as Ft. Myers, Sanibel and Captiva. These are all within a 30 min. ride. Rates may change until rental is confirmed. You are now offered damage protection; you must take it to cover any damage or lost items of the owner.